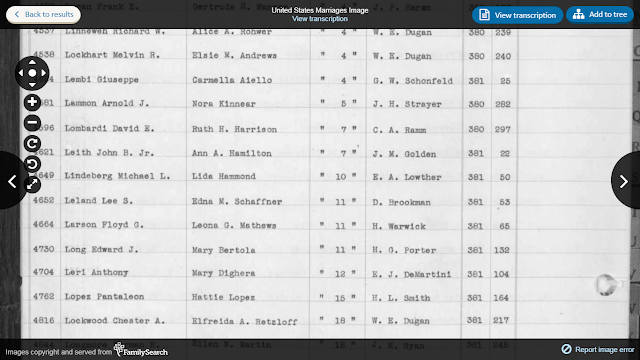 * First name(s): Lee S.
* Spouse's first name(s): Edna M.
"United States Marriages," indexed database, Findmypast (http://www.findmypast.com), California, San Francisco County, Lee S. Leland and Edna M. Schaffner marriage entry, 11 Sept. 1937,; original record on FHL US/CAN microfilm 4,269,815. 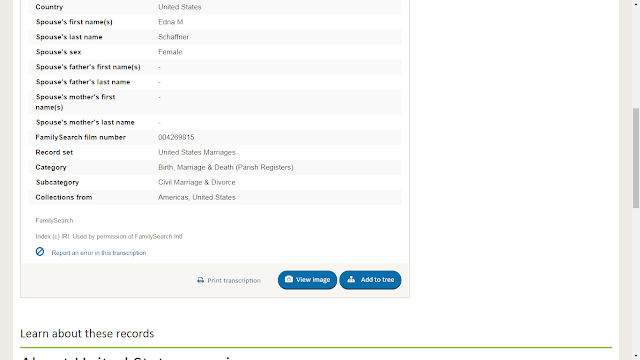 I went searching for a marriage record for Linda's parents today because I noted that I did not have a source for the marriage in my RootsMagic family tree database. The only one I could find was in this "U.S. Marriages" collection on Findmypast. I need to obtain a marriage certificate for this event, and my guess is that my brother-in-law has one. If not, I will have to write to San Francisco County for one. 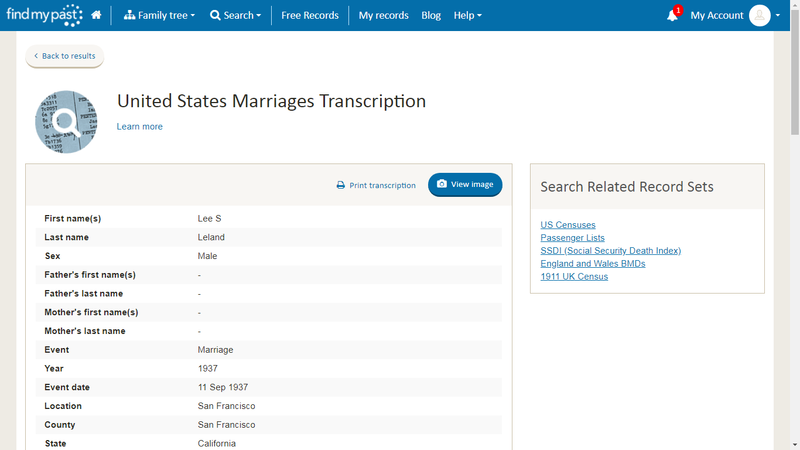 This index of the San Francisco marriages available on Findmypast tells me that the Leland-Schaffner marriage record is on Volume 381, page 53 of the record set, which is probably available at the San Francisco Public Library. 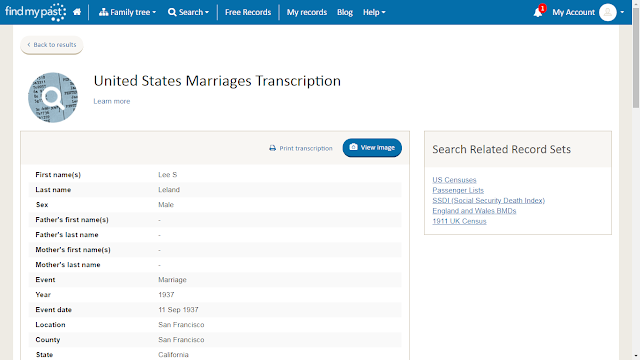 It also tells me that the minister reporting the marriage was D. Brookman. 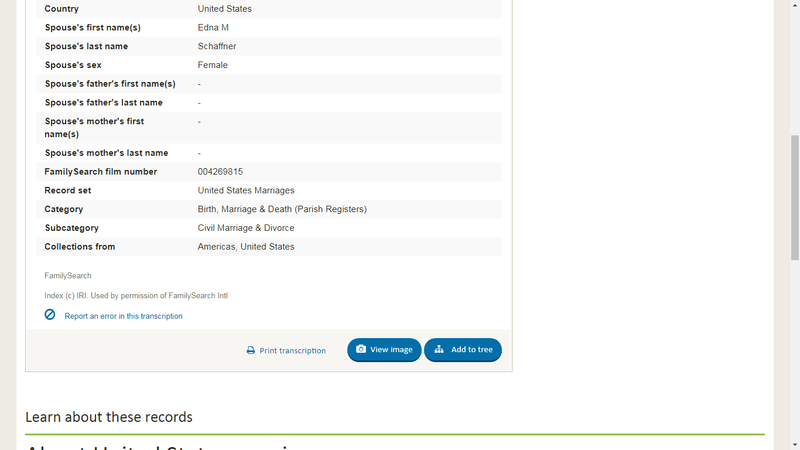 I checked the index for this large collection of marriage records, and this particular record did not appear. 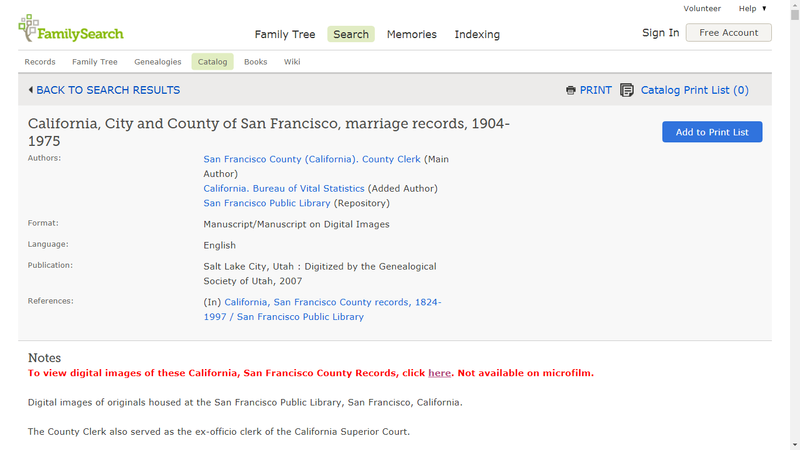 It turns out that the available digital microfilms on FamilySearch end with 1936, and the one I want is from 1937. These digital microfilms must be viewed in a FamilySearch Library. Oh well.